In 1967, the first Trader Joe’s opened its door as a humble grocery store in Pasadena, California. Five decades later, the chain has grown massively with 484 (and counting) neighborhood grocery stores nationwide. Customers love Trader Joe’s for its wide varieties of food and beverages from around the world—sold at affordable prices—as well as their helpful employees. And there’s one other thing to add to the list: Trader Joe’s listens to customers’ feedback. Near the end of 2018, Elsa Clements, of Beaverton, Oregon, initiated a Change.org petition that demands Trader Joe’s reduce its plastic packaging. 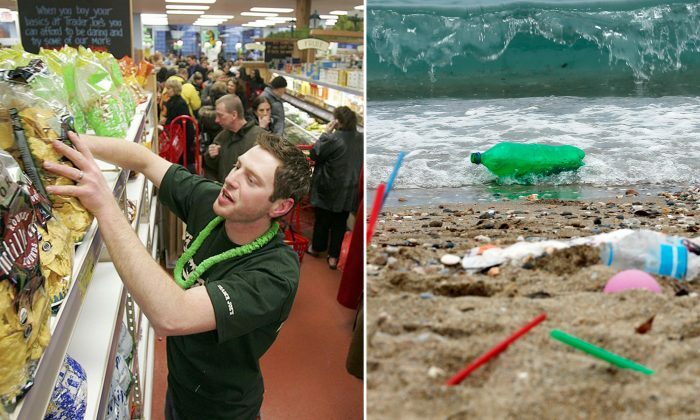 “A whopping 91% percent of plastics are NOT Recycled. Plastic is everywhere. It ends up in the ocean and then into the fish we eat, the water we drink, even as micro-plastics in salt! In 2016, the global production of plastics reached 335 million metric tons,” Clements wrote. “Trader Joe’s is great about encouraging people to bring their bags and buy organic, but they get an “F” on their packaging. I would like to see TJ’s take a bigger stand on sustainability and reduce their plastic impact,” she further added. According to Plastic Oceans Foundation, each year, we produce about 300 million tons of plastic, and more than 8 million tons of plastic winds up in our oceans. As of April 4, Clements’s petition has collected over 109,673 signatures. “We regularly shop at Trader Joe’s and don’t understand why the pomegranate white tea (branded Trader Joe’s) individually wraps each tea bag in plastic inside the box?!! Please stop thank you,” one Marin County customer, who signed the petition, commented. Apparently, Trader Joe’s officials take customers’ feedback seriously. “As a neighborhood grocery store, we feel it is important for us to be the great neighbor our customers deserve. Part of that means better managing our environmental impact,” Kenya Friend-Daniel, public relations director for Trader Joe’s, told EcoWatch in an email. On Dec. 31, 2018, Trader Joe’s announced its New Year’s resolution to reduce its plastic usage by more than 1 million pounds (approx. 453,592 kilograms) in a press release published on its website. “Taking into consideration our customer feedback and our desire to be great neighbors, we have been taking a careful look at our packaging and the opportunities that exist to make improvements, with respect to sustainability,” Trader Joe’s officials wrote. With a fundamental focus on sustainability, the national grocery chain has made numerous approaches to reduce plastic waste by: (1) ceasing to offer single-use plastic carryout bags in all stores; (2) replacing plastic produce bags with biodegradable and compostable produce bags for ease of carrying loose fruits and vegetables; (3) ditching Styrofoam packages in the produce section and replacing them with bio-based, compostable trays; (4) identifying for the vendors the harmful substances that they want to avoid in their packaging. Currently, Trader’s Joe officials are taking further steps to fulfill their commitment of eliminating over 1 million pounds of plastic from their stores in 2019. Reducing the number of items sold in plastic packages in the produce section. Replacing remaining Styrofoam trays in the fresh meat section with highly recyclable PET1 trays. Getting rid of plastic sleeves on greeting cards and replacing them with sleeves made of renewable, compostable material. Changing plastic packaging on flower bouquets to a packaging made of renewable material. Doing away with non-recyclable plastic and foil pouches used in tea packages. “We view this as ongoing work—in fact, never-ending work. As we continue in this endeavor, we are committed to openly sharing information about our progress,” Trader’s Joe officials pledged. Thank you Trader Joe’s for listening. Since China drastically cut back its imports of United States’s recycling plastic waste, it’s time for Americans to focus more on the reduce part of “reduce, reuse, recycle” plastics.